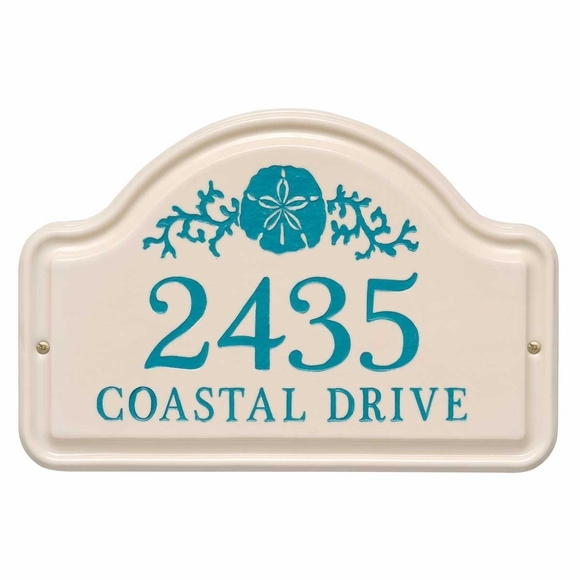 Address Plaque with Sand Dollar - - the perfect beach house address sign personalized with your house number and street name. Arch shape wall plaque made in USA. Includes two lines of personalization and the sand dollar inside the arch. Wording and design colors (shown in small images from left to right): dark blue, green, sea blue, or coral. Beach theme ceramic plaque and sand dollar accent is ideal for southern locations and beach town homes.